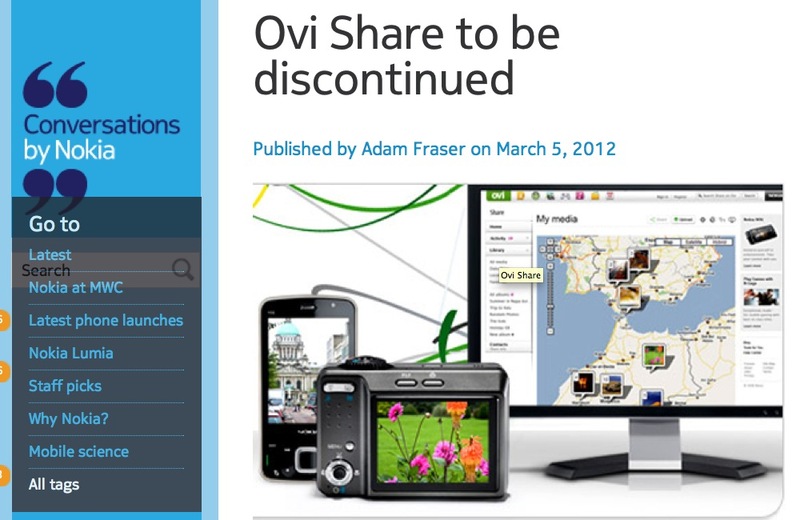 Ovi Share being discontinued, download all your data by May 30th 2012! I’m not an Ovi Share user so this doesn’t affect me so much but there are plenty who are. Nokia has made a decision, explained at Nok Conv, to discontinue the Ovi Share service. You have until May 30th 2012 to get your content downloaded (and possibly reuploaded elsewhere if you use it online) before it is not available ever again. Files can be downloaded separately or in one single zip file. Were you an Ovi Share user? We have made the decision to discontinue the Ovi Share service as of May 30, 2012. Naturally, we are committed to helping you download all of your content and make the experience as seamless as possible. If you are an Ovi Share user, you will have until May 30 to download your content before the web service will be discontinued and won’t be accessible any longer. You can either download your items in one zip package or in various smaller parts. If you have a big media library or are on a slower internet connection we recommend you to download your content in various packages as it will certainly be the more convenient option. Discontinuing Ovi Share was a business decision to help us focus on our core Nokia service offerings. The new business unit Location & Commerce, established in June 2011, is now in the center of our revised services strategy, bringing you leading location-based services like Nokia Drive, Nokia Maps and Nokia Transport. We look forward to bringing you fresh and exciting services from Nokia and Location & Commerce in the future so check back here periodically for more news. Thank you for using Ovi Share.